What is Sharon Wheeler's ScarWork? Scars are produced following an injury to the skin and underlying tissue. They can be superficial or deep and result from the natural biological process of wound repair. The scar tissue is composed of collagen fibres which makes it strong but there are fewer elastin fibres (which give flexibility). In addition the collagen fibres are laid down in a more linear direction than the natural random cross-linking fibres of healthy tissue. Any significant lesion to the body will result in scarring of some description. Scar tissue can become adhered to underlying structures causing restriction or tugging which can have far reaching consequences to other areas of the body . They can be raised, puckered or uneven . There can be holes underneath the scar or ridges of mismatched tissue. 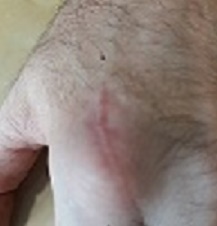 On other levels people can feel disconnected from the scar area - this can be a physical and emotional reaction to the events which led to the scarring in the first place. Sharon Wheeler works in Structural Integration and Rolfing and over many years has developed techniques to work with scar tissue to help integrate the area back in to the body. It's not about trying to make the scar disappear although the outward appearance can change significantly. It's more about releasing the ties around it to allow this area to become part of the fascial network. The work is very light and should never be painful. As the scar releases there may be physical changes to other areas of the body which were unknowingly caught up with the scar. Following a session of ScarWork there is a period of integration to allow these changes to be absorbed.